Mademoiselle Theresa Paralis, the the celebrated blind performer on the pianoforte, who is equally distinguished by her talents and misfortunes, is the daughter of M. Paradis, Secretary to His Imperial Majesty in the Bohemian department, and god-daughter to the late Empress-Queen. At the age of two years and eight months, she was suddenly deprived of sight by a paralytick stroke, or palsy in the optick nerves. At seven years old she began to listen with great attention to the music she heard in the church, which suggested to her parents the idea of having her taught to play on the pianoforte, and soon after to sing. In three or four years time she was able to accompany herself on the organ in the Stabat Mater of Pergolesi, of which she sung the first Soprano, or upper part, in the church of St. Augustin, at Vienna, in the presence of the late Empress Queen, who settled a pension on her for life. After learning of several masters at Vienna, she pursued her musical studies under the care of Kozeluch, whose lessons and concertos she plays with the utmost neatness and expression. At the age of thirteen she was placed under the care of the celebrated empytick Dr. Mesiner, who undertook to cure every species of disease by Animal Magnetism. He called her disorder a perfect Gutta Serena, and pretended, after she had been placed in his house as a boarder for several months, that she was perfectly cured; yet refusing to let her parents take net away, or even visit her, after some time, till by the advice of the Birons Stoerk and Weczel, Dr. Ingenhous, Professor Barth, the celebrated anatomist, and the express order of her late Imperial Majesty, she was taken out of his hands by force; when it was found that she could see no more than when she was admitted as Mesiner’s patient. Last year, Mad. 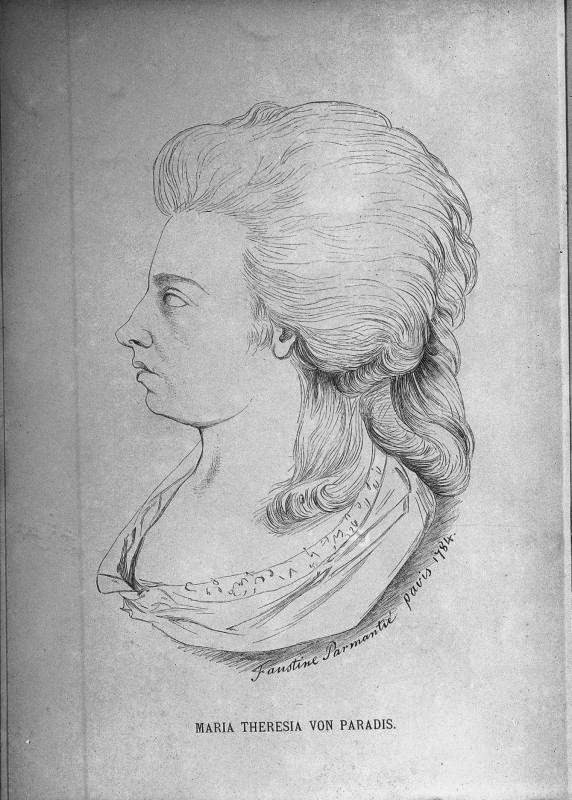 Paradis quitted Vienna, in order to travel, accompanied by her mother. After visiting the principal courts and cities of Germany, she arrived at Paris early last summer, and remained there five or six months. When she arrived in England, the beginning of this winier, she brought letters from persons of the first rank to her Majesty, the Prince of Wales, the Imperial Minister, Count Kageneck, Lord Stormont, and other powerful patrons, as well as to the principal musical professors in London. Mess. Cramer, Abel, Salomon, and other eminent German musicians, have interested themselves very much in her welfare ; not only as their countrywoman, bereaved of sight, but as an admirable performer. She has been at Windsor, to present her letters to the Queen, and has had the honour of playing there to their Majesties, who were extremely satisfied with her performance, and treated her with that condescension and kindness which all who are so happy as to be admitted into the presence of our gracious Sovereigns, in moments of domestick privacy, experience, even when less entitled to it by merit and misfortunes than Mad. Paradis. Her Majesty was not only graciously pleased to promise to patronize and hear her frequently again, in the course of the winter, but to afford her all the protection in her power; as did his Royal Highness the Prince of Wales, to whom she has since performed, at a grand concert at Carlton House, to the entire satisfaction and wonder of all who heard her. Besides her musical talents, which are indisputable for neatness, precision, and expression, particularly in the great variety of admirable pieces she executes of her master, Kozeluch, Mad. Paradis has been extremely well educated, and is very ingenious and accomplished: Being able with printing types, to express her thoughts on paper, almost as quick as if she could write. She understands geography by means of maps prepared for her use, in which she can find and point out any province, or remarkable city in the world; and is likewise able, by means of tables formed in the manner of draught boards, to calculate, with ease and rapidity, any sums or numbers in the first five rules of arithmetick. She is likewise said to distinguish many colours and coins by the touch; plays at cards, when prepared for her by private marks unknown by the company; and in her musical studies, her memory and quickness are wonderful, as she learns in general the most difficult pieces for keyed instruments, however full and complicated the parts, by hearing them only played on a violin: and since her arrival is this kingdom, she has been enabled, in this manner, to learn to perform some of Handel’s most elaborate and difficult organ fugues and movements in his book of lessons, as well as his Coronation Anthem, and more popular compositions. Despite the magazine’s praise, Paradis’ concerts weren’t as well-received in London as they were in Paris, so soon, the performer continued her tour of Europe, travelling to Hamburg, Berlin, and Prague. During her tour, she also started composing solo music for piano, pieces for voice and keyboard, cantatas and even operas. They weren’t all successful, though, and after the failure of Rinaldo und Alcina in 1797, she dedicated more and more time to teaching. In 1808, she founded her own music school in Vienna where she taught singing, piano and theory to young girls. She continued to work there until her death in 1824.